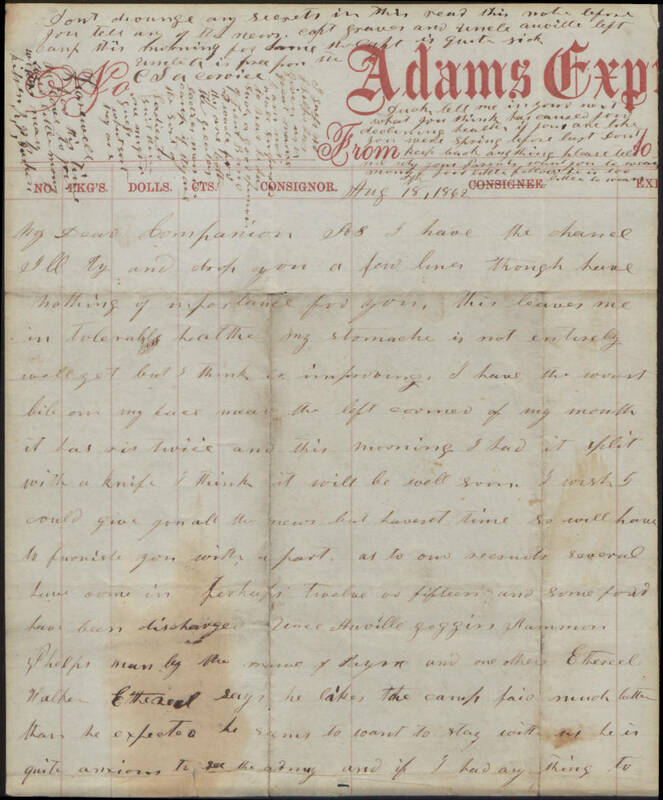 Item description: Letter, 18 August 1862, from Robert W. Parker of the 2nd Virginia Cavalry to his wife, Rebecca Louise Fitzhugh Walker Parker, at home in Bedford County, Va.
As I have the chance, I’ll try and drop you a few lines, though have nothing of importance for you. This leaves me in tolerable health. My stomach is not entirely well yet, but I think is improving. I have the worst boil on my face near the left corner of my mouth. It has ris[en] twice, and this morning I had it split with a knife. I think it will be well soon. I wish I could give you all the news, but I haven’t time, so will have [to] furnish you with a part. As to our recruits, several have come in, perhaps twelve or fifteen, and some four have been discharged: Uncle Auville Goggin, Ammon Phelps, man by the name of Payne, and one other, Ethereel Wallker. Ethereel says he likes the cam far much better than he expected. He seems to want to stay in service with us. He is quite anxious to stay in the matter, I would like for him to stay with us and see the army, if no longer. He seems quite anxious to stay and I would not be surprised, if he was to stay, if it didn’t make a man of him. I heard Charley is to come soon to service. If he does, I would like for him to come to this company. It has been a lucky company so far, but don’t know how long it will remain so, but hope for its continuance. We are quite anxious to get our company up to eighty men. Since my last to you, we have fallen back to the west side of the Rapidan, and the Yankees followed us up that stream and have fallen back, I know not how far. And I have learned that our army have commenced another advance in three columns, but I don’t know anything as to the truth of the reports. I learned from a man confined by the enemy during last fight in Culpeper that they had over twelve hundred wounded, and I know they had a great many killed. I look for a big fight soon and sincerely hope we may be successful through the help of almighty God. It is believed the reason the Yankees didn’t attack us was, they wish to move from place to place so as to keep our troops moving about till the Yankees can get their fresh troops in the field before the next fight comes off. Enough of the army. I received a letter from Ma yesterday which reached me with bad news, as did your last. It seems that the fever is taking fast hold of the family [and] will go through it before it can be stopped. I fear the family will see hard times, as they, or at least the most of them, knows but little about sickness. I am sorry to learn that your and Moorman’s health is declining. Hope it will soon begin to improve some. Don’t you nor Mory eat too much fruit, and take good care of yourselves. Oh that I could be at home to attend as best I could to your wants, for nothing would afford me more pleasure than to be with my dear companion and dear little Mory, and wait on you in sickness, and would do all in my power at any time to come and see you if it would do any good, for it is getting to the place that it’s hardly worthwhile to attempt to get home if one’s companion or parents were believed to be at the point of death. 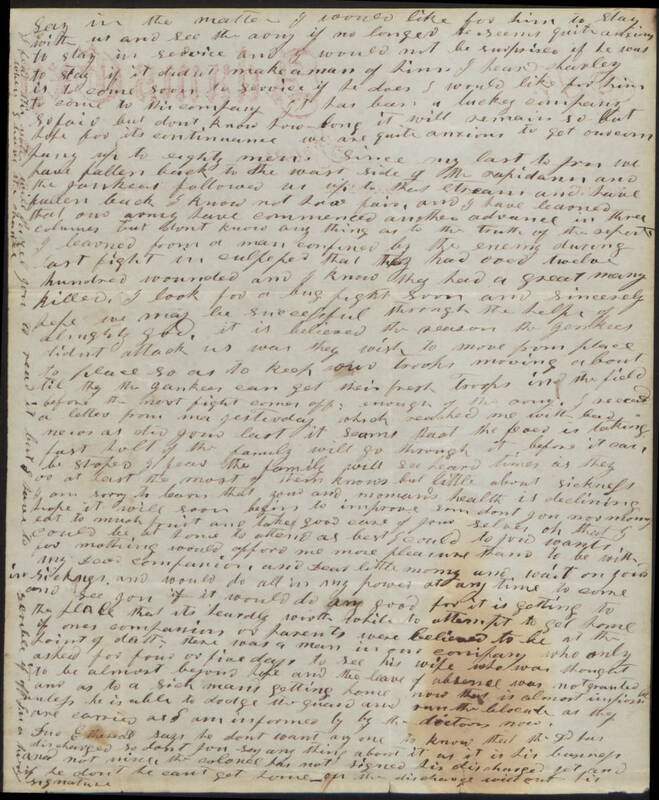 There was a man in our company who only asked for four or five days to see his wife, who was thought to be almost beyond hope, and the leave of absence was not granted; and as to a sick man’s getting home now, that is almost impossible, unless he is able to dodge the guard and run the blockade, as they are carried, as I am informed, by the doctors now. [Duck] Ethereel says he don’t want any one to know that he has discharged, so don’t you say anything about it, as it is his business and not mine. The colonel has not signed his discharge yet, and if he don’t, he can’t get home on the discharge with out his signature. I fear this note will pain you to read it, but I have to scribble it off in a hurry when I have the chance. I guess Mr. Phelps has given us a great name. I am not at all surprised to hear that he has such good opinion of Lieut. B. and Ad Wade, for they are both the greatest ladies men in camp. If they are the sort of ladies to suit them, one might guess what sort they are. Duck, tell me in your next what you think has caused your declining health, if you are like you were spring before last. Don’t keep back anything. Please tell me why your parents want you to wean Mory. Poor little fellow, he is too little to wean. This entry was posted in Southern Historical Collection and tagged 2nd Virginia Cavalry, Rebecca Louise Fitzhugh Walker Parker, Robert W. Parker. Bookmark the permalink.